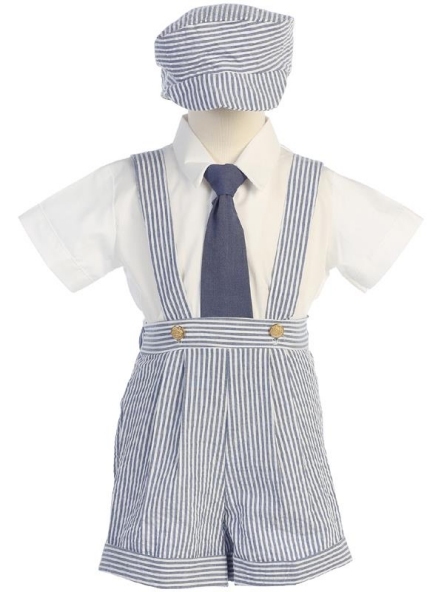 Handsome spring and summer special occasion boys outfit in a blue striped cotton seersucker. A nice choice for weddings, too. US made by better brand manufacturer, Lito. 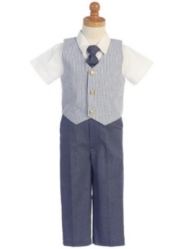 This is a 4 piece set which includes a white short sleeve cotton poly blend dress shirt, and solid blue clip-on long tie, the seersucker shorts with attached suspenders and a matching cabbie hat. Sizes 6/12 mo. to 4T. Machine washable. Runs small. 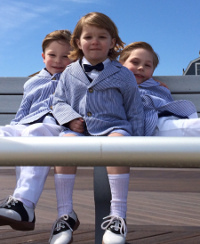 It is best to go up a size from what your child usually wears. See the general size chart. Also available in charcoal and khaki.